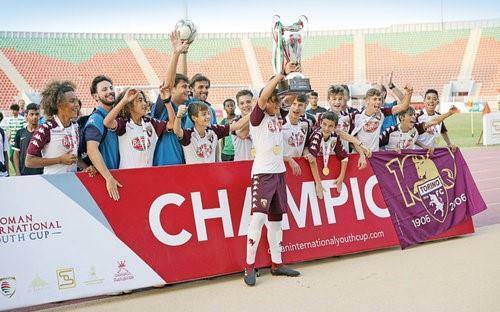 (MENAFN - Muscat Daily) Italy's Torino claimed a grand double as it won the U11 and U13 crowns on the final day of the first Oman International Youth Cup that concluded at the Sultan Qaboos Sports Complex (SQSC) on Saturday. Muscat-based ESG stole the limelight as it won the U15 crown while Barcelona Dubai lifted the U9 title. In the U11 final, Torino routed Manchester City 4-1 while it claimed a double with another dominating 4-0 win over Arsenal in the U13 final. Barcelona Dubai edged past Evolution Sports Qatar 4-3 for silver in U11 while Muscat Football Academy (MFA) took the bronze with a 2-1 win over Junior Stars. Barcelona Dubai beat Evolution Sports Qatar 1-0 in the U9 final while ESG got the better of MFA 2-0 for the bronze. Inter Milan edged past ESG 4-3 on penalties for a silver in the U13 category while Al Fohood trounced Evolution Sports Qatar 4-0 for bronze. The three podium finishes in the U15 witnessed Omani teams make a clean sweep. ESG edged past Seeb 1-0 for the gold while MFA got past Spanish Soccer Academy 1-0 for the silver. Al Khadra took the bronze with a 1-0 win over Al Alawi. It was a heartening display by Omani teams as they grabbed a total of six podiums including a gold by ESG. MFA won silver and two bronze and Al Foohood and Al Khadra had one bronze each. Besides the competitions, experienced coaches from Manchester City and Arsenal teams conducted community activities with local academies, offering professional insight to their counterparts and coaching to the young Omani players. Former Oman Football Association (OFA) chief and SABCO Group chairman Sayyid Khalid al Busaidi was the chief guest and gave away the trophies along with former Oman international star Imad al Hosni. Final standings (top three): U9: 1 Barcelona Dubai, 2 Evolution Sports Qatar, 3 ESG. U11: 1 Torino, 2 Barcelona Dubai, 3 MFA. U13: 1 Torino, 2 Inter Milan, 3 Al Fohood. U15: 1 ESG, 2 Al Khadra, 3 MFA. In a boost to football in Oman, promising Mutasim al Khusaibi, who featured in the U11 category at the first Oman International Youth Cup (OIYC), was signed up by Italian club Torino. Two other Omani youngsters, Yaqoob al Sawafi and Al Walid al Musalmi, have also been shortlisted and may be signed by the visiting pro clubs in the future, according to officials of the OIYC organising committee.